As the mobile app revolution began to leave a bloody trail through the magazine publishing world, I worked with clients such as Condé Nast Traveler to explore and exploit the opportunity. I ran Creative and UX for design firm Hudson Union for these engagements, all of which had an element of business consulting, in that we crafted the go-to-market strategy with the client, and helped them sell the idea to their customers, in addition to developing the consumer-facing apps and visual design. The first wave of tablet magazines was made up of high-budget, low-recurring-revenue “replica apps.” My team and I were tasked with developing an evolved publishing model that empowered Traveler to sell in the tablet and mobile markets in a big, high-profile way, but that didn’t have onerous recurring costs and didn’t interfere unduly with their day-to-day workflow. The model we created had to spell out how they adapted their current content into high-performing mobile content. Our strategy was to create sponsored topic mega-issues and selectively add interactivity that made sense in mobile. Because they were sponsored by advertisers, most or all of the production budget was covered. Because they weren’t published or updated every month, their recurring production costs were low. Because they were juicy collections of top-rated content on a single topic, they were evergreen and performed well over time. For all three apps, we started with a deep dive content audit in order to understand what was there, what performed well, and what we might be able to tweak to perform even better. For Etiquette 101, we pulled together content that spanned 8 different printed travel guides (previously only available to subscribers), and synthesized them into a simple, mobile-friendly visual guide. 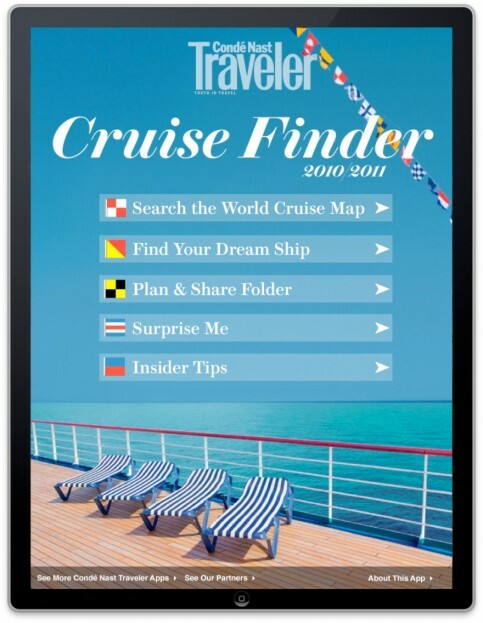 For CruiseFinder, we leveraged the magazine’s annual user survey on cruises and essentially “reversed” the flow, making the app into a faceted search tool. 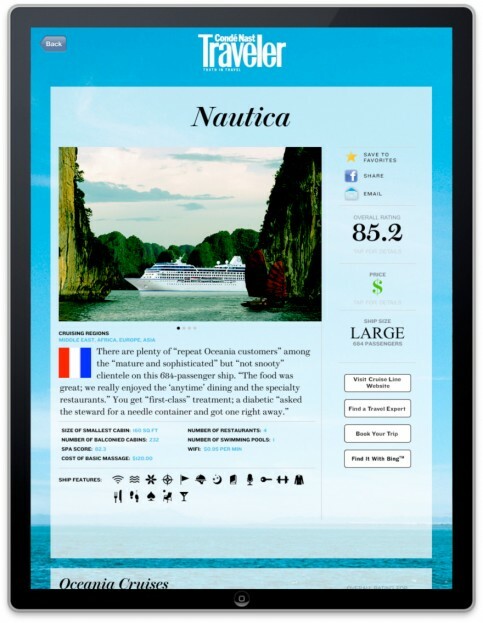 With the CruiseFinder app, not only could users search user ratings, but they also had a consolidated never-before available view of all amenities across cruise lines and routes. For The Best of Italy, we did the same reverse-survey data trick that we did with CruiseFinder for categories such as Hotels and Beaches. 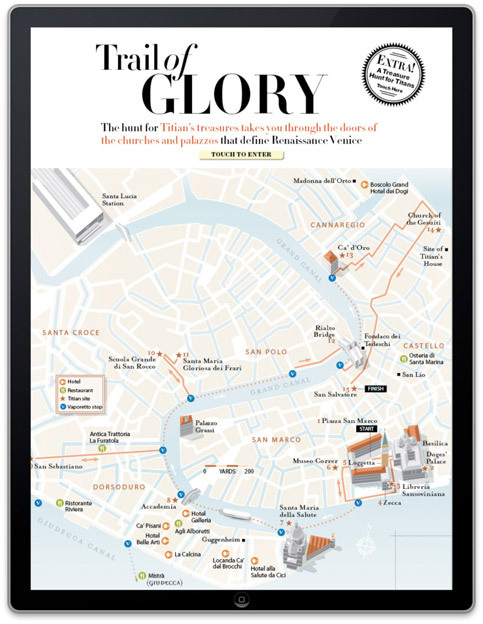 Further, we brought Traveler’s incredible custom maps to life and transformed them into interactive walking tours… perfect for mobile users! 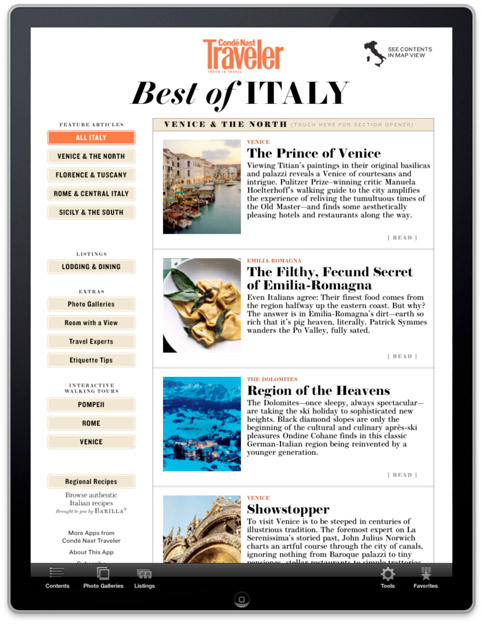 That’s what Condé Nast has tried with its new “Best of Italy: Condé Nast Traveler” app… based on a brief flip-through, it works quite nicely. And because it’s not a literal translation of a current title, the app sidesteps some of the problems that have plagued magazine apps: Print subscribers don’t feel like they’re being gouged by paying for something they’ve already bought. And jaded iPad owners can’t compare it to an existing issue and utter a bored sigh. The final crucial ingredient that made these apps successful was sponsorship. Here, our challenge was offsetting production costs so that risks were low and profits were high, without junking up the apps with too much traditional advertising. 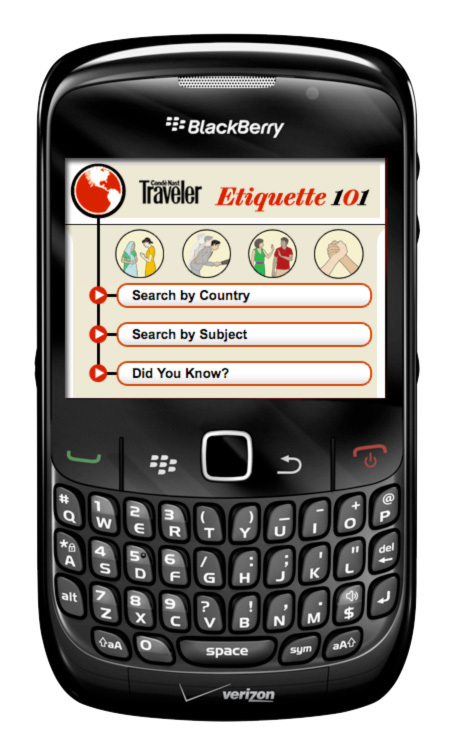 For Etiquette 101, the sale was straightforward: the sponsor, Verizon was hungry for beautiful branded Blackberry apps that would be exclusively available in their app store. The technical implementation, however, was not so straightforward. While using the available technology, making a beautiful app for Blackberry was like landing a fussy fashion designer with an OCD on Mars. Ultimately, we snuck an HTML approach into a conventional Blackberry wrapper and made one of the slickest apps in the store. You’re welcome. CruiseFinder and The Best of Italy, required much more back and forth, and custom content development with the sponsors (all the major cruise lines and Barilla Pasta, respectively). The results were balanced and satisfying for users, sponsors and the client at Traveler.